North Carolina is slow to move away from summer. Look at all those days in the 90s (i.e. red) and 80s (orange) that we had this month! Temperatures dropped a little when Hurricane Florence came through and although parts of the state were hit extremely hard with flooding, we were lucky and did fine in that storm. The first column (of color) on the left is January 1 through 15, next column January 16 through 31 etc which means the last column on the right is September 16-20. I'm using a low volume fabric to fill in months that don't have 31 days plus surrounding the overall temperature quilt. I did get myself a little twisted up this month when I added the hexie for the 16th at the end of one column instead of the beginning of the next. That meant ripping out and reattaching a whole bunch of hexies! I'll be linking my quilt up to a temperature quilt link-up plus I'll be linking up at Brag about Your Beauties, Freemotion by the River, WIP Wednesday's, Let's Bee Social, Midweek Makers. Needle and Thread Thursdays, Finish it Up Friday and Finished or Not Friday. The temperatures really did hang on during September. Here's hoping we all have a mild and pleasant October! I am a weather geek, so naturally I dig this quilt! That is a very cool quilt!! I love this so much! I am really enjoying watching your progress, and since I am also in NC, my temperatures I'm sure are very similar to yours, so seeing it creates a visual picture of my own weather year. Thanks so much for sharing this project! This is so cool idea, Patty! Well, maybe I should say "hot" right now! I want to do a temperature quilt. In fact I started doing the research on temps daily for my area and then I thought I would eventually back it with the temps from where I lived most of my life until my move north. I like your quilt with the hexagons. 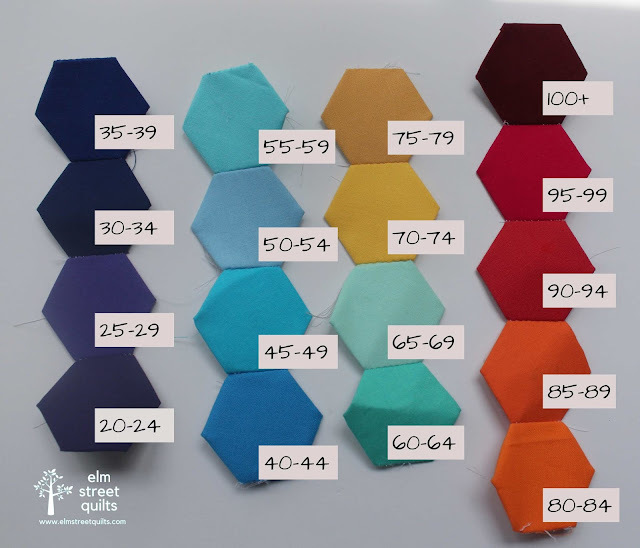 It seems like you could set up the hexagons ahead of time and then pick the temp for that time period and sew it in...is this what you did? Yours is quite interesting, and will be a beautiful quilt when you are finished! I've been looking forward to seeing your progress on the temperature quilt! It looks like a fun project! Do you hand sew the hexi on every night?